2012 Yellowfin 39 powered by triple 350s 300 hours $379,999 We ship world-wide! 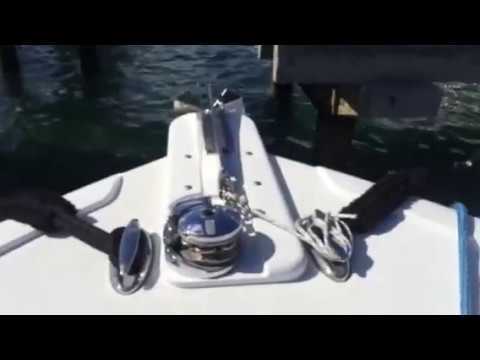 THIS IS A 2012 YELLOWFIN 39 JUST LOWERED!!! Yellowfin Yachts' new 39 offers stylish performance and tons of fishing room. I really enjoy getting to run and review new boats, especially when they are done correctly. When one comes around that is built right, it’s an exhilarating thing, and the new Yellowfin 39 is a home run in many ways. Not everyone needs a full-blown 39-foot center console, but if you dream or do have the need, you owe it to yourself to look at this boat. With a foot and a half more beam than the highly popular Yellowfin 36, the new 39 hull was based on the larger 42-foot hull, and the new model is a beast of a boat. I recently tested it with company owner Wylie Nagler out of Yellowfin’s hometown of Sarasota, Florida, on a beautiful spring day with a westerly 15-knot breeze and a rolling sea. The extra beam does so much for the boat, like providing a more laterally stable platform while running or at rest, plus the 39 can carry quad outboards without crowding them or straining to float them. You also get more storage, a larger console, expanded seating and, naturally, the thing we all want — more fishing room. I liked the gunwale heights all the way around, especially in the bow area. On larger boats of this nature, they are often too high for anglers to easily walk a fish around the bow or jump on the foredeck to throw a cast net. The dimensions on the 39 all work well, making it a safe and efficient fishing platform. Its wide gunwales make boarding and walking a net back to the wells an easy task. The 39 has a large anchor locker on the foredeck and recessed handrails all the way around the forward cockpit. In the deck, there’s a storage bin all the way forward, and under the optional coffin box, a cavernous 530-quart macerated-fish box or storage compartment on the centerline sits ready to accept a serious load. Outboard on each side are two longer storage bins. 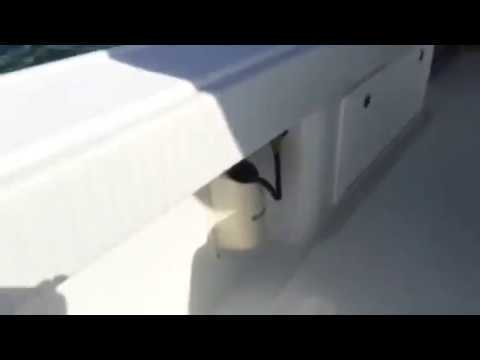 Aft of the console are two more long outboard fish or storage boxes, with large lazarette access to through-hull valves, livewell and bilge pumps, and fuel filters. These items are easily accessible. The 70-gallon livewell on the transom will hold a massive amount of bait, and Yellowfin offers an optional leaning post with another 80-gallon livewell beneath the seat, which our test boat had. The console is well laid out, with a large dash that easily houses the two 19-inch monitors. It offers great visibility and has all boat controls and switches within arm’s reach of the helm. The forward seat houses a huge insulated drink box and four vertical rod holders in each side. On the port side, a large door offers access to the walk-in console, featuring a finely finished full stand-up head compartment with electric head and shower. The compartment comes complete with teak-and-holly flooring and step pads, a classy touch for sure. There are two good access hatches to the backside of the electronics dash for easy diagnostics and maintenance. Yellowfin offers several hardtop and tower options for the 39, as well as several leaning-post options. In the performance department, the 39 is just plain awesome. Our test boat came rigged with quad 300 hp Mercury Verados, which brought it on plane quickly and pushed it to a blistering 70.2 mph before I pulled it back ­— it was still climbing. The boat stays glued to the water like it’s on rails, turns with ease and is so fast the buttons on my shirt couldn’t hold it together. The hull aggressively threw the water down and away, making for a very dry ride. The other thing that caught my eye was its incredible economy with four large outboards. At 4,000 rpm, we were making almost 45 mph and were burning around 38 gallons per hour, making 1.2 miles per gallon. That gave us a super-comfortable ride just loping along — no hanging on, easy to talk — and it would yield us a range of nearly 600 nautical miles. I could fish the Wilmington Canyon out of Beach Haven, New Jersey, for three days without needing fuel, or I could run from Key West, Florida, to Isla Mujeres, Mexico, and back at 4,000 rpm. With the price of diesel, perhaps all the big sport-fishermen will become motherships. The 39 is very stable laterally: With three of us on one side, it barely dipped. It trolled quietly, and I noticed that even with the four engines running, the bubble trail was all gathered to the centerline and was quite clean. It drifted nicely and will make a great kite-fishing boat with all the interior room and stability. When you take a close look at the market, there are less than a handful of great-performing hulls in the 38- to 40-foot class, and this 39-footer from Yellowfin is one of them. I like how Yellowfin builds its boats; I really like how they run; and I appreciate the thought, execution and inclusion of common-sense, useful fishing features that make a day’s fishing enjoyable and not a chore.